Image caption Film director Alfred Hitchcock's letter said "how impossible it was to import wines privately into California"
A letter from Alfred Hitchcock complaining about the difficulties of importing wine into US in the 1960s has been found at a wine shop in Bristol. Mimi Avery found it when she was looking through her late father's files at Averys wine merchants. Ms Avery said she forgot about it until the Cary Grant Film Festival organisers asked her if they could screen a Hitchcock film in the shop's cellars. She said the family would "keep the letter and frame it". Ms Avery said the letter had been sent in 1962 to her grandfather Ronald Avery, who "was quite well-known at the time" as he sold wine to many famous people. She said: "Averys have been exporting round the world since pre-1935. "My grandfather was born in 1899 and was in the Signals - but although he was involved in World War Two, he was asked to stop and focus on selling more wine to the USA, so that the UK got more taxes that could be used to help the war effort." Richard Avery said he remembered his grandfather telling him the story of when Hitchcock visited Avery's in Bristol. He said: "He had asked Grampy if he could come in one day to taste some Burgundies. However, when he arrived, Grampy apologised and said that he had to taste some Bordeaux samples that day." 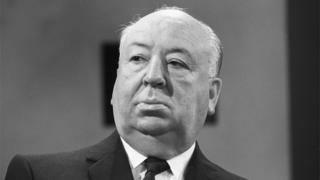 Mr Avery said Hitchcock had then asked if he could return on another day "and bring a friend" and would "be filming shortly with Ingrid". "To our knowledge, the lunch with Ingrid Bergman never happened," Mr Avery said. Charlotte Crofts, from the Cary Comes Home Festival, said: "It's amazing that Hitchcock has a connection with Averys in Bristol and that he then went on to direct Cary Grant, who hailed as Archie Leach from Horfield and then, as we all know well by now, catapulted to Hollywood stardom." Hitchcock was born in east London in 1899. At the beginning of World War Two he went to Hollywood and became famous for making films including Psycho, Vertigo, Notorious and The Birds.